A limited for-sale inventory and inclement weather combined to suppress sales of existing single-family homes last month. While job growth continues to generate new housing demand, the limited available listings are precluding many prospective homebuyers from making purchases. The dip in February sales reinforces an uneven growth pattern in the single-family resale market that has persisted during the current economic cycle and continues to influence apartment and retail property performance. Sales of existing single-family residences excluding condos declined from January to February. Measured on a year-over-year basis, however, the 2.0 percent rise in sales illustrates modestly improving buyer demand and the sound status of consumer finances. As the spring buying season approaches, though, a lack of listings may frustrate new buyers. The supply of single-family residences for sale stood at 4.8 months in February, a level conspicuously below the 6-month threshold regarded as a healthy balance between buyers and sellers. The median price, meanwhile, rose 4.3 percent over the past year to $228,600, and the gain may encourage additional listings that could relieve supply constraints. The number of single-family homes under construction reached a post-recession high in February, providing a potential outlet for homebuyers facing limited single-family resale options. Builders continue to focus on the market’s upper end, as the median price of new homes approached $300,000 in February. Sales of residences priced from $150,000 to $200,000, or so-called starter homes, accounted for only a minuscule portion of all transactions, effectively keeping first-time buyers at bay. Overall, new-home sales are down about 6 percent over the past 12 months despite an uptick last month. Multifamily units continue to be called upon to fulfill new housing demand generated by the growing U.S. economy. The combined total of for-sale and rental multifamily units represented about 57 percent of all housing construction last month, far exceeding the long-term average of 41 percent. Several U.S. metros still face significant pipelines of rentals this year that will potentially create pockets of increased vacancy, particularly in the Class A segment. This year, U.S. apartment vacancy will inch up 10 basis points to 4.2 percent as 285,000 units come online. 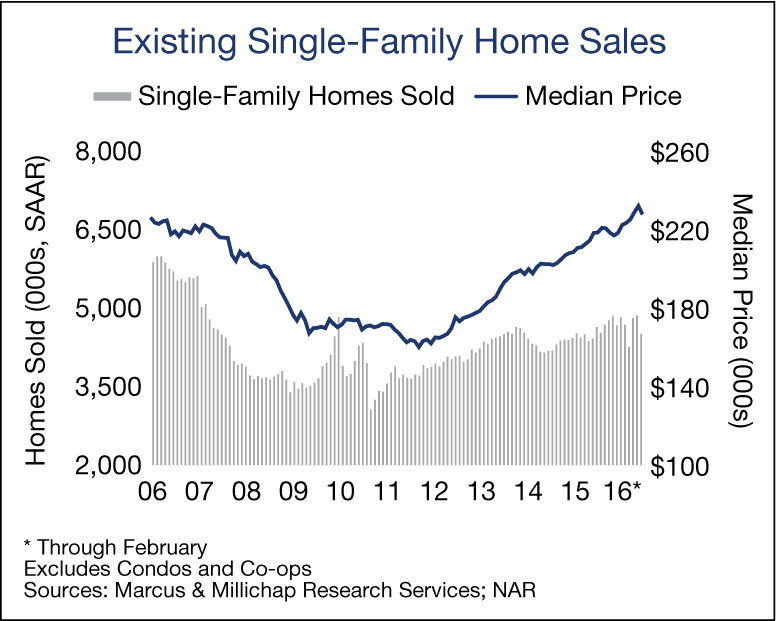 Single-family home starts remain considerably less than typical for this stage in a growth cycle, and the lack of new subdivisions is holding back retail property development. Only 47 million square feet of retail space was delivered last year and an additional 46 million square feet is projected in 2016. The backfilling of existing spaces drove down U.S. vacancy to 6.2 percent last year, but new space may be needed to relieve pent-up demand. This entry was written by marcusmillichap, posted on April 4, 2016 at 5:46 pm, filed under Uncategorized. Bookmark the permalink. Follow any comments here with the RSS feed for this post. Post a comment or leave a trackback: Trackback URL.